It's time for the second part of my skincare routine trilogy (you can check out part 1 - My Morning Skincare Routine here). I think my evening routine is the most stable and it's been pretty unchanged for several months now. The first thing I like to do when I get in and I've had a chance to sit down is remove my makeup. There are a few (usually oil-based) cleansers I might use, but this is the one I just always seem to come back to. It's a butter formula that's not too solid but I still like to warm it a little bit between my fingers before I apply it in circular motions to my face. I use this on my eyes too and although mine are very sensitive I don't find this leaves them red or irritated. It turns into an oil which lifts your makeup from your face. I prefer to remove this using a damp muslin cloth but if I don't have a fresh one to hand, this still works really effectively with just water and my hands (though there are usually a few scraps of makeup left behind that I take care of with the next step). It doesn't leave my spot-prone skin feeling greasy at all but still feels nice and nourishing as opposed to stripping (like some cleansers do). I do prefer the Emma Hardie one slightly but the price difference is huge so that's why I choose this. It's so gentle, effective, doesn't hurt my eyes, it's easy to remove and doesn't strip my skin. The ingredients include Olive Fruit Oil, Sunflower Seed Oil and Shea Butter. I'm sure you've heard plenty about this! I like to use a bit of it on a cotton wool pad just to ensure all my makeup is definitely gone - especially if I'm wearing quite heavy dark eye makeup or a full coverage foundation. A lot of people might use just this to remove their makeup but personally I find micellar waters take too long to remove every single bit of makeup if I don't cleanse with an oil-based product first. The concept of this is essentially that it is a water-based product that feels as gentle as water on the eyes but contains micelles (emulsifiers) that cling to makeup (as well as dirt and oil) and remove it. For my skin personally this isn't drying and it's much more effective than some of the others on the market. I used the Garnier one for a while but felt like I need so much more product to get the same result, which was just too time-consuming. I definitely think I take this for granted, as it was pretty game-changing when I discovered it a few years ago! It's one that I think I'll always repurchase. Besides of course water, the ingredients include Coconut Oil and Glycyrrhetinic Acid. After I remove all my makeup it's time to cleanse my skin itself. I absolutely love this cleanser and although I've been using this every evening for almost a year, I'm still only on my second bottle! It's such a unique clay-based formula that's aimed at tackling blemishes. I like to take my time massaging two pumps of this into my skin as it just feels so nice (I have my hands very slightly damp for this but my face pretty much completely dry). When I rinse it off it doesn't leave my skin feeling stripped or dry (like a lot of anti-spot products do) - it just feels very fresh and clean. It's gentle enough for everyday use and really helps keep my blemishes at bay. The ingredients contain Zinc Gluconate, Manuka Honey, Salicilin and French Clay. They really help to clear away any excess sebum and calm my skin. Although it contains a small amount of the BHA Salicilin - it's in a really small amount so it's not going to be too harsh for everyday use. That just really helps to penetrate deep into the pores and clear them out (perfect if you find yours can look a little swollen with sebum build-up). I like to use a toner after cleansing - I feel like they're a good way of putting back into your skin what you've taken out through cleansing (kind of like conditioning after shampooing). I take a bit of this on a cotton wool pad and it's just so soothing and calming. The Aloe Vera is amazing if your skin is feeling a bit sensitive and this always leaves my skin looking and feeling healthier and softer. The ingredients are pretty much Aloe Vera and Water. This can be used in the day or evening or both (if I'm having a really bad skin day!) It's a sort of cream that you can use as a serum step or a moisturiser. I love how this dries down to being virtually traceless on my skin; it absorbs very quickly and gives my skin a nice semi-matte finish (as it's oil-free). This is amazing if you're prone to breakouts - once a day just as a general anti-blemish step in your routine to keep things under control or twice a day if you're going through a particularly rough patch with your skin. I find it stops me getting so spotty in the first place and then when I am a breaking out it helps soothe and clear things up as quickly as by the next day. I just take around two pea-sized amount and apply it to my face - concentrating on the areas most prone to breakouts. The ingredients in this include the Avene Thermal Spring Water and various salts. It's very gentle and slightly exfoliating, helping to clear my pores and remove and spot-causing bacteria. It's really nice and calming when my skin is looking and feeling a bit angry. This was my absolute favourite when I went through a dry, flaky, sensitive skin phase at the start of this year and it's still one I reach for. Again, you can use this in place of a moisturiser or as a pre-moisturiser treatment. It has a cream formula and I take a pump or two and massage it into my skin. I love it because it's so nourishing but isn't heavy, greasy or irritating on my skin at all. It's incredibly soothing on sensitive skin and has really seen me through the winter months, though as we move into summer I will probably swap it out for something else. It offers lasting relief for dryness without being rich in the slightest; the light texture is what really makes this a winner for me. Ingredients include Squalane and Shea Butter, which are really going to help hydrate your skin in a natural way as opposed to caking on something heavy that's just going to smother it. I use maybe two pumps of this right before I go to sleep, as I like to leave quite a bit of time between applying to other products to allow them to work their magic. What I love about this is that it's so nourishing without being heavy. The formula feels nice and light and it absorbs into my skin really nicely. It's nothing too dramatic but it just means I wake up in the morning with my skin nice and soft and looking healthy. It's nice and gentle on my skin too so doesn't enflame anything even if my face is feeling a little red and sensitive. The ingredients include Lavender Oil, Mango Butter and Shea Butter - basically all the super-nourishing and hydrating things! What are your evening skincare essentials? The Avene Cleanance Expert is one of my favourite skincare items for my blemishes. It really does do exactly what you say, it calms my skin down better than anything else I've tried! I see you are really, really deeply in love with PIXI :) My evening routine essential is basically good double cleansing and Kiehl's Blemish Clearing cream. The latter do wonder to my skin. I wish my skin can be friends with TBS because their products are easily accessible in my country but they sting me too much. Love the sound of the Aloe toner! The Avene Cleanance range is my absolute favourite for breakouts! Might try the La Roche-Posay Toleriane Ultra Fluid as my skin is really dry and flaky at the moment. 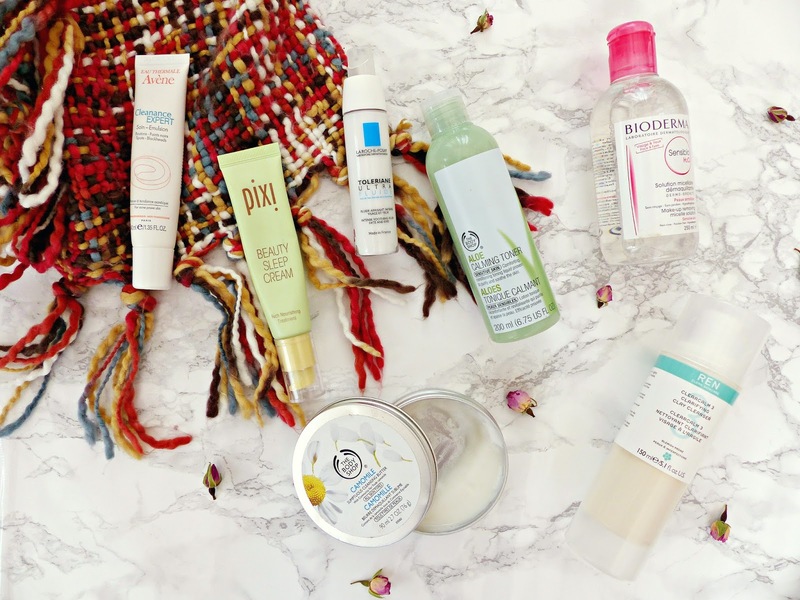 The Bioderma micellar water used to be one of my skincare essentials as well, but I haven't used it in a while! I found that the Garnier one worked just as well, didn't think about the quantity of product used each time though so I'll have to pick up a new Bioderma and compare them! I've pretty much been doing the Korean 10-12 step skin care routine and it's amaaaaazing! i always like to use an oil based makeup remover, I feel like nothing else removes my makeup properly! i have been meaning to try the toleriane range, la roche posay is one of my favourite skincare brand so hopefully i'll love the range! I really want to try The Body Shop Cleansing Butter! I've also heard it's amazing for cleaning your brushes! I absolutely love the La Roche Posay brand I want to try more products from them, I'm sure I'll pick up a lot when I visit Paris in June! Great post Jasmine! Your flat lays always look so stunning! But some great products, thanks! The Pixi sleep cream sounds great, but unfortunately I have been left a little underwhelmed by the Pixi products so far. I really want to try out the Pixi beauty sleep cream, it's sounds absolutely amazing and I've heard such good things about the brand on a whole! Would also really like to use the toner as I don't tend to use toner much! Wow, I've never used ANY of the products you mention! There are so many great skincare products out there. I'm really glad that La Roche-Posay has recently become easier to get a hold of in the US, so I may have to give them a go! I might have to try The Body Shop cleansing butter - I have been wanting to try one for a while! This one looks really good though. Everytime I've gone into The Body Shop recently, the camomile cleansing butter has been sold out! I really want to get my hands on it, though - I've heard nothing but amazing reviews!